China and Nepal have been connected by an optical fiber link, ending the country’s sole reliance on India for all of its networking needs. Nepal Telecom successfully connected to China Telecom Corporation Limited on Saturday, marking the first time the two nations have been directly connected. Commercial use of the fiber optic route is expected to commence soon. “After establishing connection, we conducted technical test about two weeks ago,” NT’s Dilliram Adhikari told China’s official press agency Xinhua. The cable goes through the Geelong (Keyrong)-Rasuwgadhi border point, whereas a previous connection attempt through the Tatopani-Zhangmu (Khasa) border point failed after the April 2015 Nepal earthquake damaged fiber laid in both nations. Adhikari said that the new route would increase speeds due to the shorter distance to regional data center hub of Hong Kong, and would also “create a competitive environment for purchasing internet services which could reduce cost of internet service” as the country can buy internet bandwith from China, instead of having to rely on India. NT has additionally signed an initial memorandum of understanding with telecom operator China Unicom for further cross-border optical fiber connectivity. 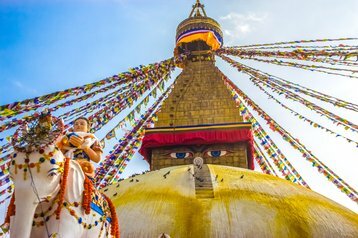 A landlocked nation wedged between India and China, Nepal has long sought to remain independent and keep on good terms with the two economic and military giants, constantly trying to balance the interests of each nation. With the Indian border being low plains with numerous trade routes, and the Chinese border being the Himalayan mountain range, Nepal has traditionally been more reliant on India - an estimated 90 percent of Nepalese trade passes through India. But under Prime Minister KP Sharma Oli’s reign, the country has begun to shift towards a Sinocentric worldview. In 2015, India publicly criticized and tried to delay the promulgation of the new Nepalese Constitution due to concerns over the treatment of the Madheshi and Tharu minority indigenous groups. Nepal then suffered a fuel crisis as a result of what it called an unofficial “trade blockade” by India over the constitution, although India laid the blame on protestors. China quickly seized upon the growing tensions, and has moved to strengthen ties with Nepal. In March 2016, the two nations signed a transit agreement giving Nepal the option to use the Tianjin port in China, which is located 3,000km from the Nepalese border, while India’s Haldia port is 1,000 km away. An agreement to build a bridge in far west Nepal to connect the country with Tibet was also signed, and China pledged a $216 million soft loan to Nepal for construction of a regional airport in its second largest city, Pokhara. This May, China also announced the opening of a new rail and road trading route to the small republic, the same month Nepal canceled its president’s visit to New Delhi and recalled its envoy. Last week, China and Nepal announced they would strengthen their military ties after a meeting between military officials. President Xi Jinping is also thought to be visiting Nepal this October.